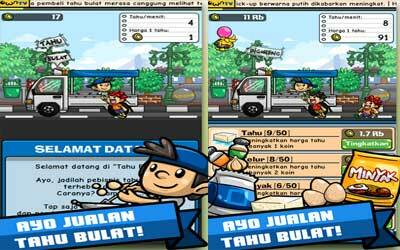 Previous version Tahu Bulat 9.5.1 apk for Android will help you to downgrade or install older app easily. This is one of the best Simulation apps. Although there is no indicator that shows the level of satisfied from customers when buying our food, from the smile they give, they seem quite satisfied. The money that you get can be reinvested, ranging from buying upgrades the vehicle that you use to sell around, bought a new tent, and others, to accelerate the arrival of buyers and add value to the food you make. In addition to simple, UI that are served by this game is quite interesting. By embedding the name and flag of Indonesia, players will be able to easily find out the origin of the inspiration. Another uniqueness is the ability to customize the look of the game with game time. The sky and surrounding objects will be changed during the night. For those who like simple games that do not want to do many action while playing, this game is right for you. Promote the Business tahu bulat, bring a new type of buyer! Dubai Branch Event(25 May – 27 June)! Prove your skill and get 500T in Dubai all time revenue to keep Dubai forever! Wake up sahur group at 3AM to 4 AM to get double bonus for 1 hour. The gameplay are simple yet, it’s addicted to play again and again, graphic are fine, BGM and SFX are brilliant. I really enjoy this game.